Absolutely Intercultural 214 +++ Erasmus 30 +++ Teaching Staff Mobility +++ Study Abroad – absolutely intercultural! Listen to an interview with our guest lecturer Lucie Thibault from Brock University in Canada. She will discuss the differences in teaching styles and conventions she noticed between Germany and Canada, as well as the benefits of Erasmus Teaching Staff Mobility Program and what she expects to get out of it. 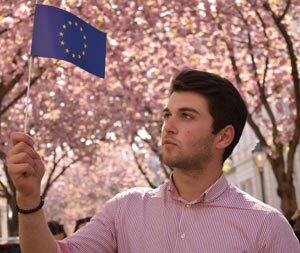 In our last category, Beka Eristavi (see photo) from Georgia will tell us about the importance of leaving one’s comfort zone and his first difficult steps on his way to becoming a participant of Erasmus Student Mobility Program. He is now a very enthusiastic and successful international student at RheinAhrCampus. Thank you all who joined us for today’s show. If you liked our show, please like us on our Facebook page, too. By the way, did you know that we are also on iTunes? You can subscribe to this show for free and give us a rating and a comment. We would appreciate that! Our next show will be coming to you on Anne Fox on 2 June. So until then stay tuned.